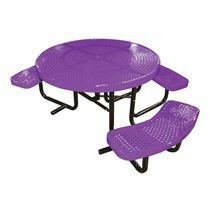 Thermoplastic Round Picnic Tables - Picnic Table Store-Commercial grade quality-lowest price. 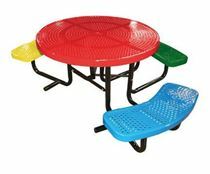 Thermoplastic round picnic tables are simply plastic coated steel that forms the tops and seats. This construction provides beautiful color, low manitenance, and affordability. The round design is just one of our favorites. Below we have a variety of different thermoplastic metal styles such as the Regal, Innovated, Perforated, UltraLeisure, and Infinity. Thermoplastic picnic tables are low maintenance making it excellent for schools, restaurants, or parks. Call our friendly staff to find the perfect umbrella for your round thermoplastic picnic table. All Thermoplastic Picnic Tables Include a 5 Year Manufacturer's Warranty. RHINO Round Thermoplastic Steel Picnic Table, Quick Ship, Portable, 229 lbs. RHINO Quick Ship ADA 3 Seat Round Thermoplastic Picnic Table, Universal Access, 210 lbs. RHINO Round Solid Top Thermoplastic Steel Picnic Table, Portable, Quick Ship, 182 lbs. 46" Single Post Thermoplastic Metal Round Picnic Table, Inground Mount, 260 lbs. Round Thermoplastic Steel Picnic Table, Regal Style, Seats 4 adults, 170 lbs. Round Thermoplastic Steel Picnic Table, Regal Style, Seats 8 adults, 200 lbs. Round Picnic Table Plastic Coated Expanded Metal with Powder Coated Steel Tube, 255 lbs. 46" Round Expanded Metal Children's Picnic Table, Portable or Surface Mount, 255 lbs. 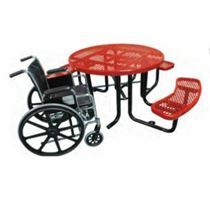 46" ADA Wheelchair Accessible Round Perforated Metal Children's Picnic Table, Portable, 225 lbs. 46" Round Perforated Metal Children's Picnic Table, Portable or Surface Mount, 300 lbs. 36" Round Thermoplastic Picnic Table with 4 Backed Seats, Portable or Surface Mount, 240 lbs. 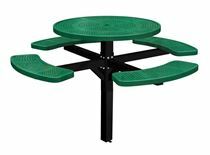 46" ADA Compliant, Single Post Thermoplastic Metal Round Picnic Table, 3 Seats, Inground Mount, 220 lbs. 46" Round Thermoplastic Perforated Steel Picnic Table, Portable or Surface Mount, 305 lbs. 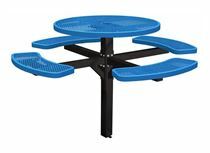 46" Single Post Thermoplastic Perforated Metal Round Picnic Table, Inground Mount, 270 lbs. 46" Round Thermoplastic Picnic Table with 6 Backed Seats, Portable or Surface Mount, 305 lbs. We offer a variety of stylish thermoplastic picnic tables such as Regal, Innovated, Perforated, UltraLeisure, Classic, and Infinity that can be found in many commercial areas such as schools, parks, and restaurants. Regal style picnic tables have top and seats made of a 3/4" #9 expanded metal with a diamond shaped design inside a 2" x 2" angled iron frame. The Regal Style is our most popular design making it great for schools and parks. Perforated style picnic tables have top and seats made of 11 gauge large hole (3/4") precision punched steel with radius edges inside a metal frame. The Perforated series is a stylish design found in schools, recreation parks, and outdoor food courts. Regal Innovated style picnic tables feature top and seats made of small hole (1/2") punched steel inside a 2" x 2" angle iron frame. The Regal Innovated Style is an elegant design found in business parks and corporate food courts. Rolled style picnic tables include the Innovated Rolled and Regal Rolled. The Innovated rolled features top and seats made of small hole (1/2") punched steel inside a rounded frame. The Regal Rolled features a 3/4" expanded metal with a diamond shaped design with rolled edges. The rolled edges add style and comfort. Ultra Leisure style picnic tables feature top and seats made of 3/4" #9 expanded metal inside a 1/8" x 2" metal strap frame. The Ultra Leisure design is popular in commercial parks where business meetings are held. Infinity style picnic tables feature top and seats made of 3/4" #9 expanded metal inside a 2" x 2" angled frame. The Infinity design is a great addition for a commercial settings.